There is I think a hardware fault developing. It occasionally freezes. Mouse pointer still active, but nothing clickable and no keyboard interactions. Forum users suggest the video card is a likely culprit (https://discussions.apple.com/thread/5022785) and a good clean may fix it. Mac OS 10.11 El Capitan is the last version of the system to support this hardware. Until now, most software has continued to run happily on that system, but I am starting to see El Capitan drop out of the support list for key software. 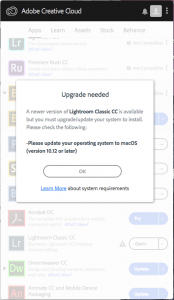 Crucially today, Adobe CC updates drop support for Mac OS 10.11. Can I hang on to see the iMacs expected to be released this or next month? Or do I part with a load of cash on a Mac Book Pro 2018? Or even consider PC if I want to get more into Oculus platforms? Unfortunately the old machine has no trade-in value – I remind myself in terms of total cost of ownership over the last 10 years or so, this has been the best value computer I have ever had. I can’t see any replacement coming close with so few options for upgrading/repairing memory or storage.